All our Training Workshops can be delivered in a variety of formats, including our unique FLEXI Training Option where we design an Event for you based on a selection of our Modules. In addition to our Training Services we work as Business Coaches with a range of Clients in a variety of sectors - so the content of our Workshops is always contemporary, proven and based on real world experience. "I really recommend David's workshops, very helpful to grow your business and we can already see some results in my company since we have started to use his strategies 2 months ago. Plus David is a fantastic person and you will have a lot of fun.. Thank you David..."
"Just had the two days training about presentation skills together with some colleagues. The course was very useful for our job and the organization was perfectly combining theory and practice. 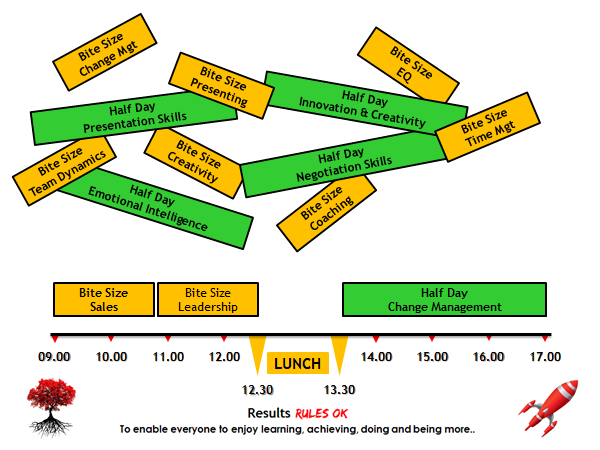 We understand that sometimes having your Team away from their desks for a whole day just isn't practical - so we developed our unique Flexi Training model so they don't have to. You can mix and match any of the subjects anyway you choose - all we ask is that the minimum booking is a Half Day duration. "An excellent workshop with David Holland MBA on Friday on business growth. I took lots of ideas away from it particularly on ‘marginal business gains’. I am not exaggerating to say it was made me rethink my business tactics and business strategy. As a business coach myself I really appreciate David’s straight forward and engaging style. I would highly recommend David’s workshops."